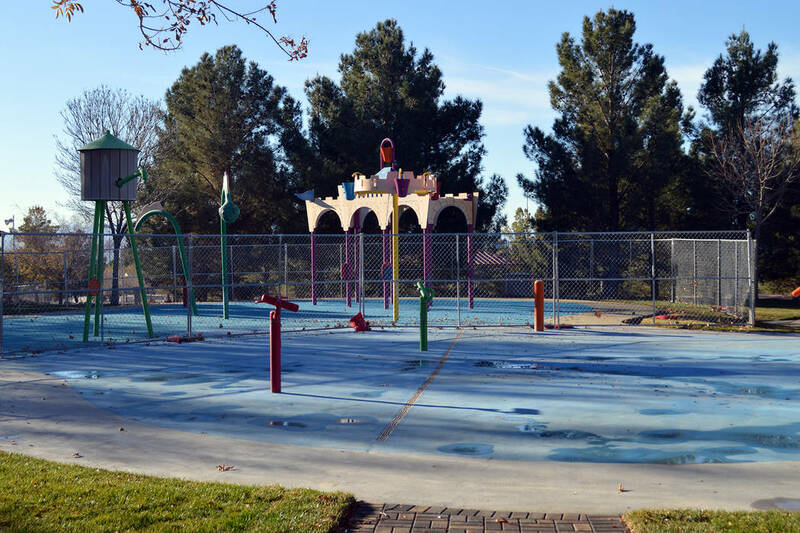 Boulder City has been improving its splash park during the winter months so that families can have a better experience once spring arrives. Celia Shortt Goodyear/Boulder City Review Boulder City's splash pad at Veterans Memorial Park on Buchanan Boulevard is undergoing renovations that are scheduled to be completed this month. Renovations at the splash park within Veterans Memorial Park include replacing the surface and improving the drainage system. Public Works Superintendent Gary Poindexter is directing the project and researched what the cities of Phoenix and Henderson had done to improve their facilities prior to starting any work. Acting City Manager and Public Works Director Scott Hansen said that staff reached out to those two cities to determine the optimal products so the city has a safe surface that lasts as long as possible while spending its tax dollars in a prudent manner. The current improvements are costing $53,000, Hansen said. Last winter, the city replaced one-third of the park’s padded surface. The park is routinely closed from October to May, so the renovation project does not interfere with residents’ use of the facility. The 25-acre Veterans Memorial Park, at 1650 Buchanan Blvd., also features four lighted multiuse ball fields, two beach volleyball courts, restrooms, a 3-acre fishing pond, model boat pond, soccer fields, skateboard and bike park, gazebos, horseshoe pits, picnic areas and acres of open green space.